These 14 job interview tips are critical in preparing for your interview and will help you avoid the most common interview mistakes. The pointers below contain true stories, example situations, and links to in-depth discussions. This step is probably one of the most overlooked job interview tips in preparing for your interview. Hiring executives are always impressed when a candidate knows something specific about their company’s products and accomplishments...and more importantly...what makes them unique among their competitors. Don’t be caught off guard if asked: What do you know about our company? What you are really being asked is: Did you prepare for this job interview by doing some research on us? How much information is adequate? This depends on the job level you are interviewing for. A CEO candidate will be expected to know a lot more than a middle manager or individual contributor. Make sure your insights about the company don’t come solely from their website. Tip: You can join industry groups on LinkedIn and Facebook to monitor member discussions and research companies. If you are working with an executive recruiter, they should be able to provide you with valuable insights into the company's culture and the backgrounds of those interviewing you. Pearl of Wisdom: Negative news about a company can be a golden opportunity in disguise. Companies want to hire people who will help them solve their problems and take them to a higher level of performance. When you bring solutions and leadership to an under-performing company, it sets you up for a quantum leap in your career. As a matter fact, it could actually be riskier to hire on with a company that’s spinning like a top. How open minded will a well-oiled company be to your ideas and insights? More often than not, they will expect you to fit into their culture and not rock the boat. Change could be resisted. Expect to be blamed if one of your ideas falls short and is resisted by your coworkers...because after all...that’s the way we’ve always done things around here. If you don't arrive 15 minutes early to practice, you're late! Everything you say and do during your job interview will be examined under a microscope. Your first test will be to see if you show up on time. There is simply no excuse to be late. Plan ahead by making sure you have good directions. You should know exactly how long it will take to drive to your appointment. Take into account traffic flow for that time of day, construction detours, or anything else that could delay you. Special Tip: It’s a good idea to get in your car the night before and do a practice run. This is another one of those job interview tips that gets easily overlooked. If you’re arriving from out of town, either arrive the night before so you can get your bearings, or arrive 2 hours before your interview so you know exactly how to get there. One of the benefits of arriving 15 minutes early to your interview, is you can pick up some useful intelligence about most companies just by sitting in their lobby and observing. Most companies have awards on the walls or other company literature to read. You also can observe how employees interact, dress, and behave to get an overall feel for the company culture. If you arrive more than 15 minutes early for your interview, just wait in your car in the company parking lot until it’s 15 minutes before your interview time. The reason is because some managers will be annoyed if you arrive 30-45 minutes before your interview as it will distract them from their work knowing you are waiting in the lobby. This is one of those job interview tips that is so important, I've actually created a webpage focusing on job interview attire. Go there now. I'll be waiting for you when you return. The power of the printed word applies here as well. If you share your strengths with your interviewers, it's duly noted. If one of your bosses said those same things about you...it's gospel. Another great example of your work is any chart or graph that illustrates specifically how you saved the company time or money...or how you made the company money. Many job interview questions are designed to get you talking. This way the interviewer can get a feel for your communication skills and personality. Be prepared to give a 30-60 second answer to each question. If you think about it, 30-60 seconds is a long time. Most TV commercials are only 30-60 seconds long. You get plenty of information in such a short time. Beyond 60 seconds, most people’s attention starts to wane. Many candidates are understandably nervous during an interview and tend to talk too much. It’s annoying and tiresome to listen to a non-stop talker who over-explains things. Guard against this by limiting yourself to no more than a 30-60 seconds response. If the interviewer needs more information, they'll ask you. You're better off leaving them hungry for more, rather than blabbing non-stop and risk turning them off. It will be well worth your time to link out to these questions to study the psychology behind each one. 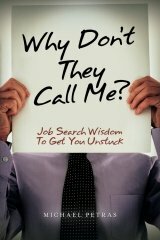 The wisdom shared here comes from 15 years of job seekers royally screwing up...and many blowing their competition out of the water. You're the seller at this early stage of the process. In my first 90 days on the job, what’s my first priority? What is one of the most difficult challenges facing your department? What’s the company’s strategy for generating new business? What kind of tools are provided to help me do my job; and, how often are they upgraded? What has the employee turnover rate been over the past 24 months? Questions about how the department is structured. Questions about their products, markets, or customers. Pearl of Wisdom: Managers want to hire people who are excited about working for them and who will help them solve problems. Once the company has made up their mind that you are the right person for the job, you can ask more direct questions as to, what's in it for me? The interviewing process is a 2-way street. Just as the company is evaluating you, you are evaluating them. A job change is a big deal and you should know things like how the 401K plan works, how the bonus is figured, what is their vacation policy, and what kind of benefits they provide. It is interviewing suicide to ask these questions during the first interview. The appropriate time to ask these questions is after the company has decided to extend you an offer. Once a company has decided that they must have you on their team, then it is timely and appropriate for you to ask these kinds of questions. What makes you stand out from among your peers? Also, be prepared to discuss any gaps in your employment or other shortcomings. Often times the interviewer will use your resume as an agenda during the interview. They will ask you probing questions about your accomplishments, or they will ask you to elaborate on something pro or con on your resume. Make sure you can back up your strengths and accomplishments with 1 or 2 specific examples. A job change completely out of your specialty. Help the interviewer to visualize your strengths and accomplishments by sharing an experience with them. Be careful not to PRE-judge a company or a position. You want to put your best foot forward throughout the entire interview before drawing any conclusions. Believe it or not, you are really in the driver’s seat...not the company. If a company makes you an offer, you can always turn it down. But if they don’t make you an offer, you don’t have any options. So, one of the best job interview tips is to wait until you have all the facts before judging this opportunity. Example situation 1: You arrive at your interview and quickly discover the offices are out of date and a little run down. Before the interview starts you conclude that you can’t work in this depressing environment. So, you go through the interview with the attitude of just wanting to get this over with, even though the manager is very nice and comes across like a good leader. At the conclusion of the interview, the manager walks you down to the lobby and asks you if you’ve seen their new $40 million office complex a mile down the road that they will shortly occupy. Example situation 2: The manager’s interviewing style seems cold and abrupt. As a matter of fact, the interview seems more like an interrogation than a give-and-take interview. You decide very early in the interview that you’re not working for this jerk, and you can’t wait until the interview is over. The other people you meet with are very professional and pleasant. At the end of the interview you learn from the HR manager that the abrupt manager you just met with is retiring at the end of the month. Every company wants positive team players working for them. Now is not the time to air dirty laundry, or point out all the shortcomings of past employers or bosses. It’s true that most people who make a job change are unhappy about something, otherwise they wouldn’t be actively interviewing. Companies instinctively know this and will often probe to find out the issues you’re having. Your job requires 90% travel and you want a better balance between your professional and personal life. There has been high turnover at the executive level which has caused doubt and uncertainty about the viability of the company. A pattern of continual downsizing has been going on which has eliminated promotional opportunities. There has been low turnover resulting in few opportunities to advance your career. A good rule of thumb is to avoid saying anything negative that could come across as being personal or emotional in nature. True Story: One time a company narrowed down their search to 2 very capable candidates. They could have flipped a coin and hired either one. But there was only one opening and they had to make a choice. The interviewing team debated over who they should hire but couldn’t decide. Then, one of the interviewers made the observation that the first candidate asked for the job during the interview. They therefore concluded that she wanted the job the most. They also concluded from this that she was decisive and not afraid to...ask for the order. This one small thing, tipped the odds in her favor, and she got the offer. It's a very good strategy to ask for the job at the end of your job interview. Look people in the eye. Sit up straight and lean slightly forward. Bring a professional looking notebook or binder to write down a few notes during the interview. Don’t be distracted or lose focus by a stone-faced interviewer or someone who shows little emotion during your interview. Special Tip: if there are 2-3 people in the room during your interview, be sure to make eye contact with each one as you are answering interview questions. Companies often do group interviews to save time and to eliminate duplicate questions. Even so, it’s more stressful to interview with 2-3 people. Some companies actually want to put you under a little bit of stress to see how you react under pressure. Often times, one of the interviewers will take the lead and ask most of the questions while the other 2 just sit there passively. Make eye contact with the passive interviewers in the room as you respond to questions. This is a good interviewing technique and always scores points with the interviewers. This is one of those little job interview tips that has made a difference for many of candidates. Good lawyers use a similar technique when coaching witnesses on how to use positive body language on the stand. Lawyers suggest that when a witness responds to questions, they should occasionally glance over at the jury and make eye contact with jurors. This has a psychological affect of making their testimonies more believable and also makes the witness seem more warm and honest. If your interview goes well and runs longer than expected, it’s possible that the hiring authority may invite you to continue your interview over lunch or dinner. This doesn’t happen very often, but just in case, you should be prepared. I knew a company where the hiring manager liked to do this and would always ask the candidate to drive. He reasoned that a messy car full of junk would probably be a good indicator of how a person’s workspace will look like. Last but not least...Be Yourself. Trust your feelings. If the chemistry is right, you’re going to feel comfortable once the interview gets going...and you will naturally click with people. On the other hand, if the interview is awkward and you feel uncomfortable most of the time; then, this probably is not the right opportunity for you. It’s normal to feel nervous and uneasy. But if you’re prepared you should soon warm up to those who are conducting your interview. If you walk out of the interview seeing yourself working there, then trust your instincts. This is a big decision. Make sure you feel good about it.